Unforgettable memories await you at this 1-bedroom, 1-bathroom vacation rental home in the heart of Panama City Beach. Whether you're seeking a romantic getaway or a place to spend time with your family, this recently remodeled home for 6 is the perfect place to enjoy the ocean breeze. With ocean views, access to Emerald Beach Resort's awe-inspiring community amenities, and a convenient location, this Sunshine State sanctuary has everything you'll need to soak up the sun. After a day at the beach, find refuge from the sun in the spacious living room. Boasting a flat-screen cable TV, Wii console, and games, the living room has everything you'll need to pass the time until dinner is ready. As you play cards on the plush couch, your group's chef can whip up their signature dish in the fully equipped kitchen. No matter what they choose to prepare, you're sure to be impressed as you take your first bites in the new seagrass bar stools. Serenity awaits you in the bedroom where you'll enjoy a peaceful night's rest in the new king bed. Not ready to call it a night? Watch your favorite shows on the bedroom's flat-screen cable TV as your little ones slumber on the beautifully painted twin-over-twin bunk bed. Be sure to bring your k-cups to brew a fresh cup of coffee with the Keurig and enjoy the morning breeze on oceanfront furnished balcony until it's time to start the day. With Emerald Beach Resort's community amenities sitting just steps from your front door, you won't have to travel far for a day of family fun. One thing is for sure, the times shared with loved ones at the fitness center, game room, 3 heated pools, and community grilling area, aren't ones that are soon to be forgotten. 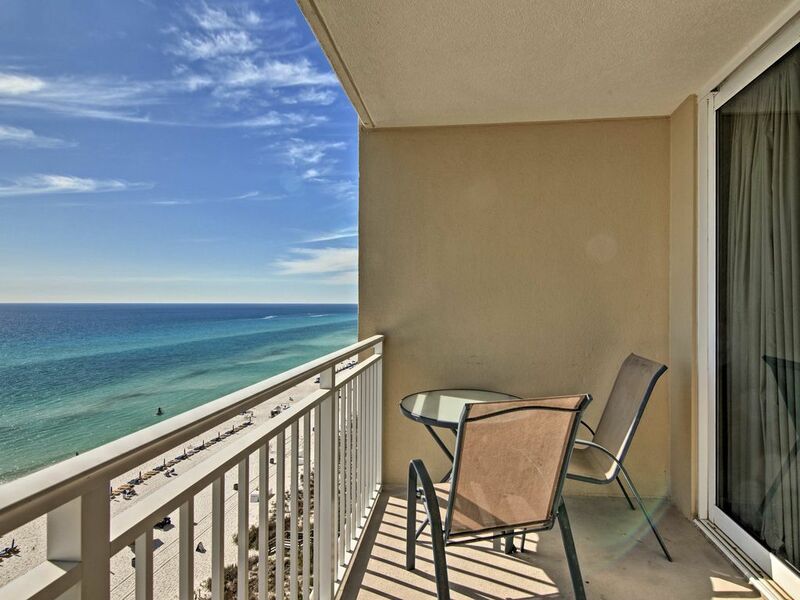 No trip to the Gulf Coast is complete without a trip to the beach, so grab your umbrella and reap the spoils of this condo's unbeatable location. Sitting just steps from the beach, the condo offers endless opportunities to sunbathe, snorkel, swim, and more! For a more high-octane Gulf experience, head 17 minutes down the road to Adventures by the Sea and rent a vessel. Whether you choose to ride a jet ski, rent a pontoon boat, or even go parasailing, you'll spend a day seeing the beach from a different perspective. Jet ski and watersport rentals are available on-site within the community as well! Make a trip to Gulf World where you and your group can get up close and personal with dolphins for an unforgettable swim! Be sure to leave some extra space in your luggage because you're going to shop til you drop at Pier Park. Located just 5 minutes from Emerald Beach Resort, this 900,000-square-foot shopping center is Northwest Florida's premier shopping and dining destination. Traveling with kids? Spend a day experiencing some of P.C.B. 's kid-centric attractions like Ripley's Believe It or Not, Race City Amusement Park, and Wonderworks! The property is also located within view of Hidden Lagoon Super Racetrack and Golf, where the ultimate family experience awaits. - Amenities include a fully equipped kitchen, Keurig, furnished balcony, ocean views, 2 flat-screen cable TVs, Wii, beach chairs and towels, free WiFi, garage parking for 2 vehicles, laundry machines, and much more! - Emerald Beach Resort's Community Amenities include 3 heated pools, on-site jet ski and watersport rentals, fitness center, game room, gas grills, shuffleboard, and more! This was our first trip to Panama City Beach. We were here to watch our son graduated AIT at Fort Rucker, then spend a few days with him. We drove the whole beach frontage road before we went to the property and we agreed this was the best looking resort on the beach. Easy to park and get to room. Room clean, big kitchen. Close to Pier Park for shopping and restaurants all around. If we ever get back to Panama City Beach we would check availability on this unit first. I looked at a lot of units available and the price was right for this one too. Very comfortable and clean in a great location! We were very impressed with the location and its proximity to the places we needed to be for the weekend of our son's wedding. The condo was clean, comfortable and nicely decorated. The pictures online don't do it justice. We highly recommend and would stay again. The amenities were great and the owners provided great information leading up to and during the stay (at the information table provided). We used recommendations for nearby eating establishments and had great experiences at both. My family and I have spend a lot of time in Panama City however this is the first time we have stayed in this particular condo, let me just say we were very impressed! I will most definitely be staying here from now on. It was very clean and welcoming. We felt like we were at home!! I loved the location and all the immensiies . We loved our stay and had a great time !! Kids first beach trip was Wonderful! We had an Awesome Trip! The Condo was Great, Beautiful Beach view, very Clean, the owner supplies two beach chairs, and umbrella. Thank You To the Johnson's for sharing your Condo with us! This condo is great! We had the best view of the ocean and the owners we very prompt at responding to any and all questions I had! They are awesome! We really enjoyed our vacation and will hopefully be returning to it in the future!! !